At this point, it’s becoming plain to see that the occult system of mathesis, including the Tree of Life, goes beyond Neoplatonism right into the teachings of Pythagoreanism. While I’m not annoyed at this per se, I am annoyed because Pythagoreanism is one of those things I haven’t studied too well before. There’s plenty on Neoplatonism, sure, and plenty more on Hermeticism, but on Pythagoreanism itself, all I know is that it had a huge effect on later philosophical and mystery traditions and that’s about it. That said, that’s basically the thrust of the academic and historical record of what we know; when we get into pinpointing exactly what in those later traditions had their roots in Pythagoreanism, it’s hard to say, since we have so little original source material on Pythagorean practices and beliefs. So, all this Tetractys of Life stuff is half read from summaries of Pythagorean thought and half made up based on my own experiences and knowledge. I have no idea if any such Tetractys of Life has been developed before, but then, I don’t suppose it matters at this point if it did. One of the texts I’ve read before, obtuse as it was, is the Timaeus of Plato. Plato, that awesome student of Socrates and teacher of Aristotle, wrote a number of books using Socrates himself and many other Greeks of his day as his mouthpieces, exploring various aspects of philosophy. Of course, philosophy back in classical Greece had a much wider scope than modern philosophy; back then, it was focused on understanding how to live well, with questions of existence and ontology coming in second (or so I see it). Plato is known for many of his works, especially his Republic, wherein he talks about the ideal city-state ruled by a philosopher-king. Other works of his focus on things of arguably smaller scope, but the Timaeus is an exception to this. This text talks about nothing less than the creation of the cosmos itself and how the structure of the cosmos is perfect in every way, and how everything that happens is directly attributable to the harmonies and ordering of the cosmos. It’s a fascinating read, though the famous Roman writer Cicero himself claimed that he never was able to understand it. First then, in my judgment, we must make a distinction and ask, What is that which always is and has no becoming; and what is that which is always becoming and never is? That which is apprehended by intelligence and reason is always in the same state; but that which is conceived by opinion with the help of sensation and without reason, is always in a process of becoming and perishing and never really is. Timaeus explains that the two major aspects of a physical body is that it is visible (able to be seen) that it is tangible (able to be touched). These are provided by the elements of fire and earth, respectively, but here we come into a problem. Any two properties can only ever be joined together by a third intermediate quality, so that the three become a harmony. That would suggest there to be three elements, but interweaving mathematics into this proto-alchemical description of physical bodies, there need to be four in order for bodies to be a solid. Remember that, in geometry, a single point is only ever a single point; two points define a line; three points define a form (a triangle); four points define a solid (a tetrahedron). If each element is like a point, then if we only had three elements, we would all be living in Flatland, but since we’re three-dimensional beings, we need four elements. Thus, we need two medians between fire and earth, which become air and water. Fire is linked to water by the mean of air; air is linked to earth by the mean of water. Thus, every individual body consists of these four elements which provide it with earthy tangibility and fiery visibility, linked together by the qualities bestowed upon them by air and water. While Timaeus does not give what these qualities are, we can see in Agrippa (book II, chapter 7) that air gives bodies the ability to be heard and water the ability to be tasted or smelled (the two are similar in nature). We can treat each of these qualities as an interplay between the soul and the body: fire allows other bodies to be perceived in a soulful way by the soul (only indirect contact), air to be perceived in a bodily way by the soul (indirect contact over a distance), water to be perceived in a soulful way by the body (indirect contact in close proximity), and earth to be perceived in a bodily way by the body (direct contact). Whereas he made the soul in origin and excellence prior to and older than the body, to be the ruler and mistress, of whom the body was to be the subject. And he made her out of the following elements and on this wise: Out of the indivisible and unchangeable, and also out of that which is divisible and has to do with material bodies, he compounded a third and intermediate kind of essence, partaking of the nature of the same and of the other, and this compound he placed accordingly in a mean between the indivisible, and the divisible and material. He took the three elements of the same, the other, and the essence, and mingled them into one form, compressing by force the reluctant and unsociable nature of the other into the same. When he had mingled them with the essence and out of three made one, he again divided this whole into as many portions as was fitting, each portion being a compound of the same, the other, and the essence. So we know that the soul is made in a different way than the body and with different materials. Instead of using the four elements, Timaeus claims that the soul is made from two parts, the indivisible and the divisible, or “the nature of the same and of the other”. Sameness and Difference, then, are the two qualities of the soul, but as we saw above, any two properties can only be joined by means of a third, and Timaeus gives us that as “the essence”, or Existence. Sameness, Difference, and Existence are the qualities of the soul, which can be described as the quality that makes an object A the same as object B, that makes A different than B, and that makes A come to be at all. Because the soul is not a body, the soul does not require a fourth substance, and is satisfied with only three properties, much as a triangle defined by three points forms the foundation for the tetrahedron with four. And he proceeded to divide [the creation] after this manner: First of all, he took away one part of the whole , and then he separated a second part which was double the first , and then he took away a third part which was half as much again as the second and three times as much as the first , and then he took a fourth part which was twice as much as the second , and a fifth part which was three times the third , and a sixth part which was eight times the first , and a seventh part which was twenty-seven times the first . After this he filled up the double intervals [i.e. between 1, 2, 4, 8] and the triple [i.e. between 1, 3, 9, 27] cutting off yet other portions from the mixture and placing them in the intervals, so that in each interval there were two kinds of means, the one exceeding and exceeded by equal parts of its extremes [as for example 1, 4/3, 2, in which the mean 4/3 is one-third of 1 more than 1, and one-third of 2 less than 2], the other being that kind of mean which exceeds and is exceeded by an equal number. Where there were intervals of 3/2 and of 4/3 and of 9/8, made by the connecting terms in the former intervals, he filled up all the intervals of 4/3 with the interval of 9/8, leaving a fraction over; and the interval which this fraction expressed was in the ratio of 256 to 243. And thus the whole mixture out of which he cut these portions was all exhausted by him. This entire compound he divided lengthways into two parts, which he joined to one another at the centre like the letter X, and bent them into a circular form, connecting them with themselves and each other at the point opposite to their original meeting-point; and, comprehending them in a uniform revolution upon the same axis, he made the one the outer and the other the inner circle. Now the motion of the outer circle he called the motion of the same, and the motion of the inner circle the motion of the other or diverse. The motion of the same he carried round by the side to the right, and the motion of the diverse diagonally to the left. And he gave dominion to the motion of the same and like, for that he left single and undivided; but the inner motion he divided in six places and made seven unequal circles having their intervals in ratios of two-and three, three of each, and bade the orbits proceed in a direction opposite to one another; and three [Sun, Mercury, Venus] he made to move with equal swiftness, and the remaining four [Moon, Saturn, Mars, Jupiter] to move with unequal swiftness to the three and to one another, but in due proportion. Timaeus explains, using what is now famously known as Plato’s Lambda, how the universe itself was created according to a system of musical harmonies. Suffice to say that the Demiurge took two “strips” of reality, one made from the even numbers in Plato’s Lambda and the other made from the odd numbers, and joined them together in the form of a giant Khi (Χ), bending them around into circles to form a sphere. The outer circle is given the property of Sameness, while the inner one the property of Difference. 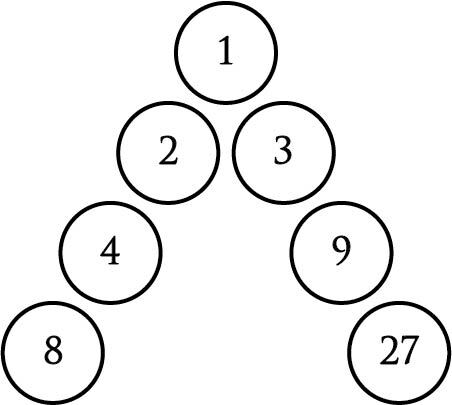 The inner circle of Difference, moreover, was divided into seven segments, each associated with the spheres of the seven planets who move at different rates. The outer circle of Sameness, however, all move at the same rate; this then becomes the sphere of the fixed stars. Linking the two heavens together is a connection at their nexus, which we can assume to be the nodes between the ecliptic (where the planets, Sun, and Moon move in the skies) and the celestial equator (where the stars all move along around the Earth). The circle of the Same (the sphere of the fixed stars) is kept as one indivisible unit, much as the One itself is; the circle of the Different (the spheres of the planets) are divided, emphasizing their created nature and focus on manifestation and embodiment. At the top, we have the Monad, the One, the Good, the uncreated creator of all things. At the bottom, we find the four elements of Earth, Water, Air, and Fire. Water, as we said before, is the mean between Earth and Air, and Air itself is the mean between Water and Fire. These four elements create a physical body with the capacity to be seen, heard, smelled/tasted, and touched. The body, moreover, is built upon the soul, which itself is composed of three qualities: Sameness, Difference, and Existence, which allow the soul to distinguish these things in the cosmos. We see three reagents: Salt, Mercury, and Sulfur. We can link these three reagents with the three properties of Difference, Existence, and Sameness, respectively, based on Plato’s Timaeus. After all, in using Plato’s Lambda, we’ve already established that we’re using the same notions of “left” and “right” in terms of directions down and from the Monad, and the Demiurge (saith Timaeus) “he carried round [the motion of Sameness] by the side to the right, and the motion of the diverse diagonally to the left”. This assigns Salt the property of Difference, and Sulfur the property of Sameness. This gives Mercury the property of Existence, which links Sameness and Difference. Admittedly, it’s at this point that I started freaking out, thinking back on other definitions of Salt and Mercury. After all, isn’t Mercury traditionally assigned to be the cold and moist counterpart to hot and dry Sulfur? Yes, but these two reagents alone require a basis to work upon, which is Salt, the materia upon which other forces can act. Salt, much as Plato describes elsewhere in terms of the element Earth, can only ever be Salt; it can be acted upon, compounded, and transformed, but anything that exists will always be Salt, though in a different form than before. Timaeus describes, further, that when the Demiurge made the soul, he “mingled [the three properties] into one form, compressing by force the reluctant and unsociable nature of [Difference] into [Sameness]”. Difference is hard to mix in with anything, and in order to do it the Demiurge required something to blend it in with Sameness. So, while Mercury and Sulfur might be opposite, they’re not opposite in the same way that Sulfur and Salt are. The alchemical perspective here is a bit unclear, and the planetary associations of the Moon, Mercury, and the Sun seem to work better. However, Salt is literally an “other”, unable to work in the same way as Sulfur or Mercury, but which can be worked with Sulfur by means of Mercury. Confused? I am, too, a little. But basically, the Timaeus tells us that Mercury is what allows Sameness and Difference to co-exist since Mercury is what allows for Existence. If everything were Sulfur/Sameness, everything would follow the active principle and would have no body; everything could only be visible and joined together in an infinite oneness. If everything were Salt/Difference, everything would follow the passive principle and could not be seen; everything could only be touched and distinguished through spatial location. In order for the soul to bridge the gap between space and awareness, it must relate to both in a manner that Sulfur can work and Salt can be acted upon. Said another way, the three principles of Existence, Sameness, and Difference allow the soul to determine what actually exists, what is the same as itself, and what is different from itself. The soul, not being a body, recognizes the body as the most different from itself, while the soul itself is made in the image of the Monad, and so is natively inclined towards making. Thus, the Salt which is used in producing bodies is Difference, and Sulfur which produces bodies is Sameness. This is how the principles of Salt, Mercury, and Sulfur work together to form the foundation of elemental substance. This logic reassured me, since I had the momentary worry of freaking out that I had mis-constructed my Tetractys of Life by putting Salt and Mercury in the wrong spheres on the Tetractys. Rereading Timaeus, however, and a few other alchemical texts, leads me to believe that this is alright and ties in alchemical theory with Pythagorean cosmology (which, admittedly, isn’t something that should probably not be done as whimsically as I’m doing here). And in speaking of the copy and the original we may assume that words are akin to the matter which they describe; when they relate to the lasting and permanent and intelligible, they ought to be lasting and unalterable, and, as far as their nature allows, irrefutable and immovable-nothing less. But when they express only the copy or likeness and not the eternal things themselves, they need only be likely and analogous to the real words. As being is to becoming, so is truth to belief. In the beginning, there is only the Monad; we cannot yet call it the Creator because there is nothing Created. We cannot truly call the Monad as existing, because there is nothing that is not existing; we obviously cannot call the Monad becoming, not just because it cannot become as created things become, but because nothing is becoming. Before the Monad creates, there is only ever the Monad, and all dichotomies and distinctions and differences are moot. Once the Monad creates, however, there is suddenly Creator and Created; as the Monad creates, it creates in its own likeness, providing Sameness; as it provides Sameness, it provides Light to see that which is the Same. Thus, we have Monad producing Creating force producing Sameness producing Visibility, or Monad producing Light producing Sulfur producing Fire. At the same time, however, the Monad has also produced the Created, which is different from the Monad; this Difference then provides Tangibility. 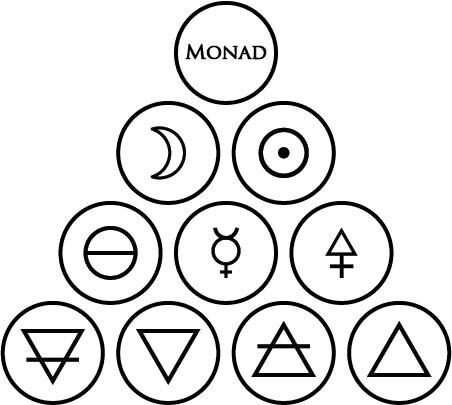 Thus, the Monad also gives forth the force of being Created or Darkness, which produces Difference or Salt, which produces Tangibility or Earth. Sameness and Difference require the mean of Existence to facilitate further creation between the two, which is to say that Sulfur and Salt require the intermediary of Mercury. Visibility and Tangibility require two intermediaries of Audibility and Taste to create a body, which is to say that Fire and Earth require the intermediaries of Air and Water. The soul, interfused everywhere from the centre to the circumference of heaven, of which also she is the external envelopment, herself turning in herself, began a divine beginning of never ceasing and rational life enduring throughout all time. The body of heaven is visible, but the soul is invisible, and partakes of reason and harmony, and being made by the best of intellectual and everlasting natures, is the best of things created. And because she is composed of the same and of the other and of the essence, these three, and is divided and united in due proportion, and in her revolutions returns upon herself, the soul, when touching anything which has essence, whether dispersed in parts or undivided, is stirred through all her powers, to declare the sameness or difference of that thing and some other; and to what individuals are related, and by what affected, and in what way and how and when, both in the world of generation and in the world of immutable being. And when reason, which works with equal truth, whether she be in the circle of the diverse or of the same—in voiceless silence holding her onward course in the sphere of the self-moved—when reason, I say, is hovering around the sensible world and when the circle of the diverse also moving truly imparts the intimations of sense to the whole soul, then arise opinions and beliefs sure and certain. But when reason is concerned with the rational, and the circle of the same moving smoothly declares it, then intelligence and knowledge are necessarily perfected. And if any one affirms that in which these two are found to be other than the soul, he will say the very opposite of the truth. The body is moved by soul; the soul is moved by reason. Reason deals with Sameness and Difference, but soul consists of these as well as Existence. Reason exists on a higher level than soul does, which allows to reconcile directly the forces of Creating with Created without need for a mediator. Reason is not Existence; reason is the relationship that reconciles Creator and Created, the intermediary between the Monad and the Triad. Reason works outside the circles of Sameness and Difference, closer to God than the fixed stars themselves are. Thus, the Dyad is reason, or spirit, that which moves the triadic soul as the soul moves the tetradic body. These concepts are replete throughout nearly all later philosophical and occult works, even being repeated in Cornelius Agrippa’s Scale of Four almost verbatim. While I had a few inklings about the concepts I wanted to explore on the Tetractys based on where I’ve already been and what I’ve already done, I admit that my reading list has not been exhausted like it should have been before I proposed to embark on making a new occult system. Rereading the Timaeus should have been one of the first things I did, and here I am finally going over it and finding more ways to explain the system I’m developing in a way that I should have explored beforehand. While the Tetractys of Life is, indeed, likely a thing that’s been made before, it probably was only done in florid 2500-year-old language without the help of Adobe Illustrator, so at least I can innovate in some way. At this point, I’m finding more and more data and knowledge to back up my structures and plans for exploration, and I can’t say I’m displeased about that. Fine-tuning and tweaking, especially to the paths, will still be needed, but I can rest certain that the overall structure is good to go.